The Loddon River is the second longest river in Victoria (after the Goulburn), enjoyed by anglers and waterskiiers and supplying water to hundreds of irrigators along its 430 kilometre length. The Loddon River flows from the Great Dividing Range in the south to the River Murray in the north. Tullaroop Creek is the main tributary in the upper Loddon River system. The middle of the the river has many sections that carry water away from the river onto the floodplain. The lower Loddon River is joined by Pyramid Creek at Kerang and from there becomes part of the River Murray floodplain. The Boort wetlands are on the floodplain west of the Loddon River, downstream of Loddon Weir. 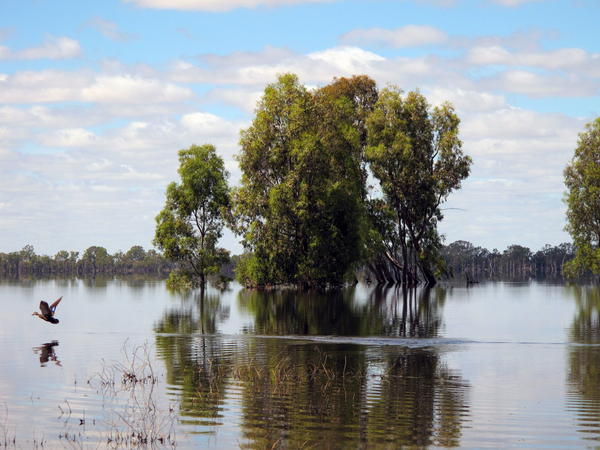 The temporary and permanent freshwater lakes and swamps - Lake Boort, Lake Leaghur, Lake Yando and Little Lake Meran and Lake Meran - cover more than 800 hectares and receive water for the environment. The Loddon River is rich in Aboriginal cultural heritage, with scarred trees found throughout the waterway. It is also an environmental treasure, feeding the internationally recognised Ramsar wetlands in Kerang and providing a home for Murray cod, golden perch, Murray-Darling rainbowfish and the critically endangered silver perch. The Loddon system's waterway manager, North Central Catchment Management Authority (CMA), is undertaking ongoing river restoration work through environmental flows, including the Native Fish Recovery Plan – Gunbower and lower Loddon. High rainfall in July, August and September 2016 delivered one of the biggest floods recorded in the Loddon system. In December 2016, water for the environment was released to Serpentine Creek for the first time. The Loddon River is home to platypus, river blackfish and small native fish such as flat-headed gudgeon, Australian smelt and mountain galaxias. In the Boort wetlands, at Lake Yando, 12 rare plant species have been recorded including the jerry-jerry and water nymph. The white-bellied sea eagle, Latham's snipe and eastern great egret have been sighted at Lake Boort, Lake Leaghur and Lake Meran. Little Lake Meran is a swampy woodland with black box trees on the highest wet margins and river red gums fringing the waterline. The shallow areas provide feeding habitat for waterbirds and shorebirds, such as musk duck and common greenshank. The upper reaches of the Loddon River are brimming with a diverse fish population, while the rare Murray-Darling rainbowfish are found in the middle sections of the Loddon River. 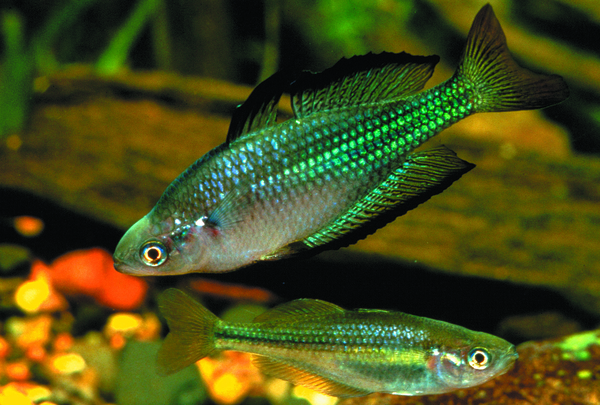 Water for the environment over the past 10 years has helped the vulnerable Murray-Darling rainbowfish make a comeback, and support movement of golden perch and the critically endangered silver perch in Pyramid Creek and the lower Loddon. Since the end of the Millenium Drought, North Central CMA has been working hard to restore flows and habitat in the Loddon River for native fish, as well as frogs and other animals, by putting in the right amount of water for the environment at the right time. "Monitoring is showing it is working, with a significant increase in Murray-Darling rainbowfish in a number of the region's rivers, including the Loddon. In fact, these fish are booming," said North Central Catchment Management Authority (CMA) Environmental Water Manager Louissa Rogers. Monitoring is undertaken by the Arthur Rylah Institute under the Victorian Environmental Flows Monitoring and Assessment Program (VEFMAP). Water for the environment is also delivered to the Loddon River to maintain or increase populations of platypus and critically endangered silver perch, Murray cod and golden perch. One of the environmental watering objectives is to create opportunities for young platypus to move to new, high-quality habitat so they are not competing for space and food, and become more resilient to predators such as foxes. Pyramid Creek flows into the lower Loddon River near Kerang, providing a corridor for fish to move from the Loddon system into Kow Swamp, Gunbower Creek and the River Murray. Platypus may also travel through Pyramid Creek and the Lower Loddon. Many fish in the Loddon system, such as golden perch, are very mobile, and it is critical that they can move freely through the system to feed, breed and complete their life cycle. Barriers in the Loddon system, such as weirs and reservoirs, prevent fish from moving around effectively. In recent years the North Central CMA and storage manager Goulburn-Murray Water have been working together to build fishways to help fish get to where they need to feed and breed. New fishways on the Loddon River at Canary Island, and Box Creek at Kow Swamp, have opened up passages for vulnerable native fish. 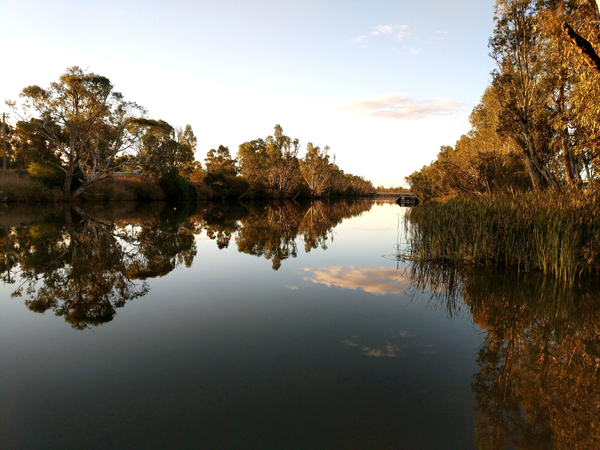 In October 2017, the first coordinated release of water to the Loddon River and Pyramid Creek provided a high flow to attract fish from the Murray River through Kerang Weir and then further upstream into Kow Swamp on Pyramid Creek and the Loddon River. Healthy streamside vegetation is important for supporting woodland birds and other animals. The condition of vegetation throughout the Loddon system varies depending on recent watering and the impacts of grazing and weed invasions. The upper Loddon supports healthy growth of native riparian vegetation. However, the vegetation in the lower reaches of the Loddon is degraded in many places, with only 13 percent of original vegetation remaining in the area. The environmental watering program aims to maintain river red gum, tea tree and lignum, and provide opportunities for new plants to germinate and grow. The Loddon River partially supplies the Loddon Valley Irrigation Area and is essential for the region's economy. The river provides recreational fishing opportunities for golden perch and Murray cod. At Bridgewater there is a designated general waterskiing and camping area, which attracts visitors who take part in waterskiing events including the Australian Masters in January and the pre-Moomba tournament in February. Aboriginal communities have lived near the Loddon River for thousands of years. The river has long provided valuable resources for Traditional Owners including food, materials and medicines. 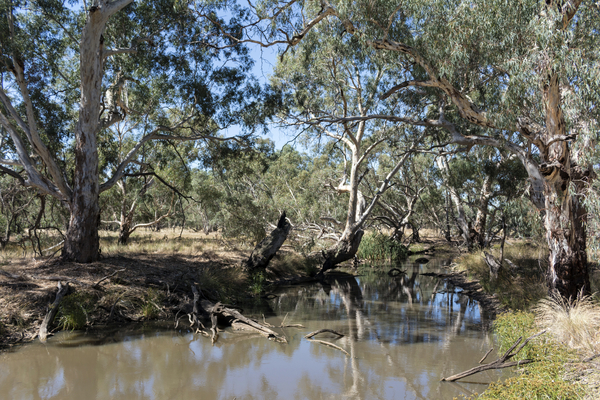 The Loddon River continues to be an important place for Traditional Owners and their Nations. The Registered Aboriginal Party (RAP) in the region is the Dja Dja Wurrung Clans Aboriginal Corporation and the Traditional Owner groups are Barapa Barapa and Wemba Wamba. The Baraba Baraba and Wemba Wamba Aboriginal people lived downstream of Kerang, where middens, graves, scarred trees and stone artefacts have been found. There are many mounds or 'middens' along the Loddon River and throughout its floodplain wetlands. Middens contain stone artefacts, charcoal, animal bones and freshwater mussel shells, and were often used as Aboriginal burial sites. Scarred trees are culturally significant sites found along the river. Bark was removed by Aboriginal people to make canoes, shelter and shields. The waterway manager for the Loddon River system is North Central Catchment Management Authority (CMA). The water storage manager is Goulburn-Murray Water and the environmental water holders are the Victorian Environmental Water Holder and the Commonwealth Environmental Water Holder. The Loddon River has a highly complicated water distribution system due to irrigation modifications to the natural waterways. On the upside, this regulated system makes it possible to manipulate the timing of water release at multiple locations, but it also has many structural barriers that affect the timing and volume of releases. In recent years North Central CMA and Goulburn-Murray Water have upgraded infrastructure to improve fish passage in the Loddon system at the Chute, Box Creek regulator and Kerang Weir. The river has three main water storages at Cairn Curran, Tullaroop and Laanecoorie reservoirs. 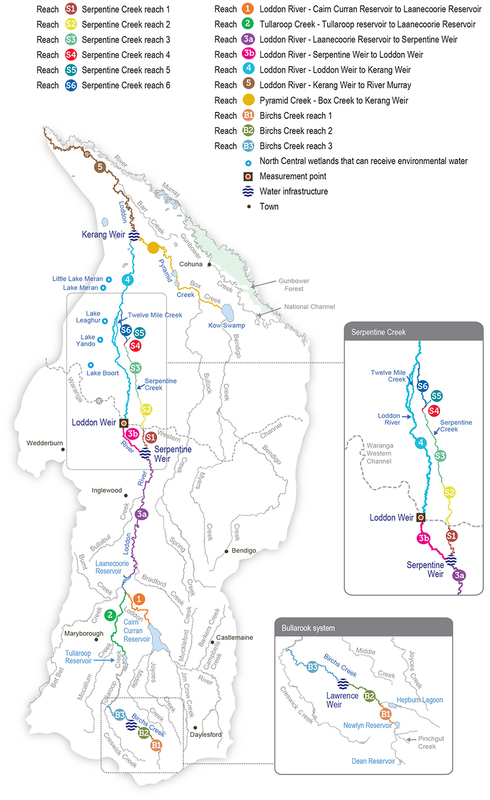 Water for the environment can be delivered to the Loddon River from Cairn Curran or Tullaroop reservoirs or from the Goulburn system via the Waranga Western Channel. Water is provided to Pyramid Creek from the Murray system via the National Channel. Water is diverted from the Loddon River to Serpentine Creek and to the Loddon Valley Irrigation Area to support agriculture. There is good potential for environmental watering in the reach from the Loddon River to Kerang Weir to meet environmental objectives as it doesn't carry irrigation water.